Holder II, Theodore S. "Sam"
Harting III, Ralph J. "Jay"
Carrillo Jr., Rafael A. "T. J." Shelley Sr., Ronnie L. "Rod"
Lutz II, George Anthony "Tony"
Durbin Jr., Jerry M. "Michael"
Yearby, Hatak Yuka Keyu M.
Much of the discussion of President Ford's legacy has centered on his pardon of President Nixon for any crimes he may have committed during his tenure. That decision had an immediate negative effect on President Ford's approval rating, dropping him from the mid-60s to 50%. I reviewed the approval ratings of Ford in an earlier post here. In this post I turn to the reaction to the Nixon pardon, both during Ford's time in office and since. The figure above focuses on the period from September 1974 through the 1976 campaign and the end of Ford's term in January 1977. To compare the responses, we need to take account of some substantial differences in question wording. Survey organizations used three broad categories of question wording during this period, though there was some variation even within these categories. 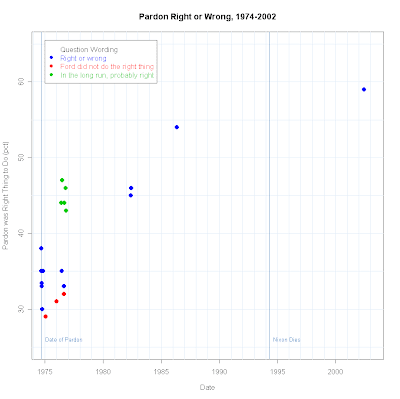 I've grouped them as "Right or wrong" for questions that used some variation on the phrase: "Do you feel it was right or wrong for President Ford to have given former President Nixon a full pardon?" The key fact about this wording is that it explicitly offers both "right" and "wrong" options in evaluation of the pardon. Several pollsters used variations on this basic pair of alternatives. The second wording was phrased negatively: "He (Ford) did not do the right thing in giving former President Nixon a full pardon." The respondent had to agree or disagree with this statement. This wording was used by Louis Harris and Associates only. The third variation was "In the long run, it was probably right to pardon former President Nixon," emphasizing both the long run and offering only the positive assessment of the pardon. CBS and the New York Times used this variation. Taking account of these differences, it is clear that there was strong opposition to a pardon before Ford acted. The Harris and Gallup polls completed just before September 8, 1974 found only about 35%-37% of respondents saying it would be "right" to grant a pardon. Immediately after Ford announced the pardon, this fell to between 30% and 35% saying he had done the right thing. The Harris question appeared to run some 3-4 points below the balanced "right or wrong" question wording. However, Harris tested this in August 1976 by including both their negatively phrased question and a balanced form "As far as you personally are concerned, do you think President Ford was more right or more wrong to have given former President Nixon a complete and unconditional pardon?" The results were 33% "more right", compared to 32% for the "right" side of their negatively worded question. So by that evidence perhaps the question wording didn't matter as much as it might seem it should on the face of it. 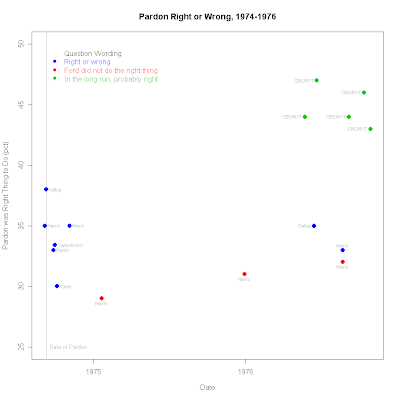 A balanced Gallup question in June of 1976 found 35% saying the pardon was the right thing, so the difference between that and Harris is again around 3 points. In sharp contrast, when CBS/New York Times asked a positively worded question that also stressed "in the long run", the results were considerably more favorable. Between May and October 1976, CBS/NYT asked this question five times, with "probably right" getting between 43% and 47% of responses. While more respondents disagreed with this question than agreed in 3 of the 5 polls, the view was clearly more supportive of Ford's decision than previous polling had suggested. While the negative wording of the Harris poll appears to have had a 3-4 point effect in reducing support for the pardon, the combination of long run and positive wording in CBS/NYT appears to have produced almost a 10-12 point boost in support for the pardon. What we can't know, of course, is which was "right". Based on the two balanced questions asked in the summer of 1976, it seems likely that support for the pardon was largely unchanged from 1974, at between 33% and 35% support. Whether the CBS/NYT version was tapping an important distinction in public attitudes or just showing the influence of question wording is not answerable with the data we have. Regardless of the "true" level of support for the pardon in late 1976, it is apparent that Ford's decision remained more unpopular than not through the election campaign. How much effect this may have had on his electoral support remains a question for another day. Gallup asked how important the pardon was to voters in September 1976. 22% rated it a 5 (on a 5 point scale of importance) compared to 35% rating it a 1, suggesting some decline in salience of the issue by that time. The CBS/NYT question stressing "in the long run" turns out to map pretty well with polling much later in time. In May and June of 1982 (I presume for the 10th anniversary of the Watergate breakin) ABC/Washington Post and Gallup both asked a balanced "right or wrong" format question about the pardon. They found 45% and 46% respectively saying the pardon had been the right thing, very much in line with the 1976 CBS/NYT results, but a substantial 10-12 point upturn from the last balanced questions we have from the summer of 1976. 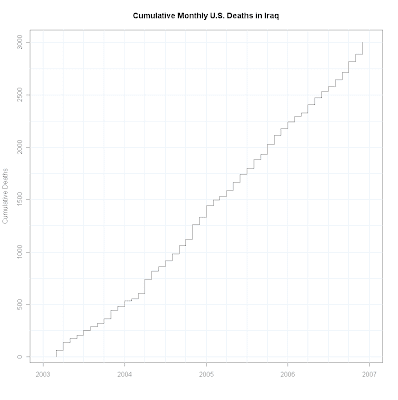 These longer run data are shown in the plot below. Four years later in early May, Gallup found support for the pardon rising to 54%, with a opposition to the pardon falling below support for the first time by a substantial margin to 39%. This again used a balanced "right or wrong" format. Richard Nixon died on April 22, 1994. No polls that I've found asked about the pardon at that time so we don't know if his death caused any reevaluation of the pardon. ABC/Washington Post asked the "right or wrong" question again in June 2002, 30 years after the Watergate break in. This time those saying the pardon was the right thing rose to 59%, with only 32% continuing to say it was the wrong thing to do. If the question is repeated in the aftermath of President Ford's death, it seems likely that support for his unpopular decision may now top 60%, reversing the verdict of 1974. Since it is impossible to know what would have happened in the absence of a pardon, we can never be sure if Ford's decision spared the country prolonged division or whether it was a decision that thwarted justice. The long run verdict of popular opinion, however, has clearly come over to Ford's side. President Gerald R. Ford died last night. Today's initial stories have stressed his role in restoring the country after Watergate, and have emphasized that he was a decent man. They also dwell on his pardon of President Nixon. I thought it might be worthwhile to review President Ford's approval ratings as an alternative way of recalling his presidency. 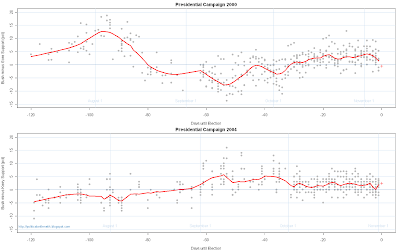 While less easy to judge "good" and "bad", the data are also less sentimental about his time in office. President Ford assumed the Presidency on August 9, 1974. Replacing the disgraced Richard Nixon, Ford received an initial 71% approval rating in the Gallup poll. The honeymoon was short lived, however. Ford pardoned Nixon on September 8, 1974. The subsequent Gallup poll, taken 9/27-30/74 found his approval fallen to only 50%. While he climbed back to 54% just before the 1974 midterm election, he fell to 47% immediately after the election, in which the Republicans lost 49 seats in the House. He spent almost all of the rest of his presidency below 50% approval. Ford was plagued by a bad economy, and his "Whip Inflation Now" (WIN) campaign proved a rhetorical as well as policy disaster during the fall and winter of 1974-75. The spring of 1975 brought foreign policy reversals. The fall of Saigon was the final act of the Vietnam war, with the evacuation of the U.S. embassy providing a visual metaphor for U.S. failure. A month later Cambodia seized the merchant ship Mayaguez. Ford sent marines to rescue the crew, which succeeded but at the cost of some 41 U.S. lives. The immediate aftermath of his decisive, if costly, action was a distinct "bump" in the polls to over 50% approval, but this proved temporary with approval falling back to around 45%. Ford was the target of two assassination attempts in September 1975, the first by Lynette "Squeaky" Fromme, a member of the Charles Manson family and the second by Sara Jane Moore. Fromme's gun failed to fire, but Moore got off one shot which missed the President. It is amazing that these two attempts on his life did next to nothing to raise President Ford's approval ratings which jumped at most 2 percentage points in the aftermath, and immediate subsided again. Ford's approval ratings remained near 45% throughout the summer and fall of 1975. His campaign for the Republican nomination in 1976 raised his approval ratings, but only marginally. Initially Ford did quite well, but Ronald Reagan closed with a series of primary victories and nearly denied Ford the nomination. During this period Ford's approval initially rose to as high as 50% but sank under the Reagan assault back to 45% in June, after the last primary. Following its then standard practice, Gallup did not ask presidential approval during the rest of the summer or during the fall campaign, so we don't know how the convention or the fall campaign and debates affected Ford's approval rating. However, in December 10-13, 1976, following his defeat, the public looked back on his presidency with somewhat more approval, registering a final 53% approval rating. In retrospect, President Ford presided over a difficult period in both economic and international arenas. His decision to pardon President Nixon clearly cost him substantial support and has lived on to be the single most debated decision of his presidency. As a weak president facing an overwhelmingly Democratic Congress, it is perhaps not surprising that few of his initiatives were well received by Congress. The economic dilemmas he faced were substantially the same as those that damaged the subsequent Carter presidency. These may well have been beyond the power of any president to "cure". 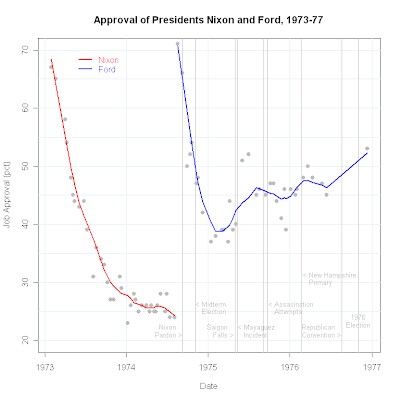 The Ford approval record shows that after the pardon, and the fall midterms, the public approval of President Ford gradually improved from the lows of late 1974 and early 1975, but never sustained majority approval after that. Only in retrospect, both in late 1976 and perhaps today, is the judgment on balance more positive than negative. I'll take a look later today at the Nixon pardon in more detail. The Democratic race for the presidential nomination has seen some small but interesting dynamics, though there is much yet to come. (I posted on the Republican race here last week.) As with the GOP post, I've include every Democrat who has been included in any poll's list of candidates. (Rep. Dennis Kucinich (D-OH) who declared his candidacy Dec. 12 has yet to appear in a poll and hence is omitted from the figure. He'll of course be added as soon as poll results exist. Former Alaska Sen. Mike Gravel also declared his candidacy on April 17, 2006 but has yet to appear in any polls. See the handy list at CQPolitics.com here.) All polls included here are of "Democrats" or "Democratic primary voters" (which may include some independents. The lede here (already somewhat buried-- Sorry Ray, I know you taught me better!) has to be that Illinois Senator Barack Obama does not yet have the nomination sewed up, despite what breathless prose and unimaginative yet endlessly repetitive use of "rock star" in stories might have you believe. ("Obama" and "rock star" appear in the same paragraph of 122 stories since September 1 according to LexisNexis.) If we actually pay some attention to the data, we get a more reasonable assessment of the Senator's support. The surge in support for Sen. Obama is quite real since October 22 when he suggested he might consider a presidential bid. Prior to that the three polls that had asked about him as a possible candidate had all registered support well below 10%. In the 11 polls that have included his name since October 22, Obama has been supported by between 11% and 23% of Democrats polled, averaging 17% support. (The trend line in the figure is a poor indicator of recent trends with so few polls, so the overall average of 17 is probably the best current estimate of his support.) That is impressive for a first term Senator, and the reports of enthusiasm (not to mention a Newsweek cover that suggests the race is down to Obama vs. Sen. Hilary Clinton) are a fine way to launch a campaign. But any sensible reading of these data show that while Sen. Obama has enjoyed a brief flurry of attention and a surge in support, he is far from catching up to the actual front runner, based on the polls, Sen. Clinton, whose most recent polls are over twice as high. This is to disparage poor reporting rather than Sen. Obama's chances. But those chances deserve a serious and longer term look rather than the hype we have seen. Now that the initial flurry of media excitement is passing, the question is whether the trend in Obama support can establish an upward trajectory. So far we simply don't know because his polling history is far too short for any confident estimates. Sen. Clinton has easily led the field so far, as any poll reader would know. But there is a bit of a dynamic in her support that has been less remarked upon. While holding at or above 40% throughout 2005 (with one mid-year and two late year exceptions), Sen. Clinton has seen some non-trivial erosion of support through 2006, falling from 40% to 33% support (based on the trend estimate), though rebounding to almost 36% at year's end. That hardly constitutes a collapse, but does suggest that the lead is not immovable. It is also clear that this decline came before "Obama-mania" took hold in late fall. So while Sen. Clinton continues to be the clear "front runner" in the polls, her hold on Democratic support is not entirely solid. Those not satisfied with her as a choice are liable to jump to a seemingly viable alternative, a well known phenomena in presidential primary polling. 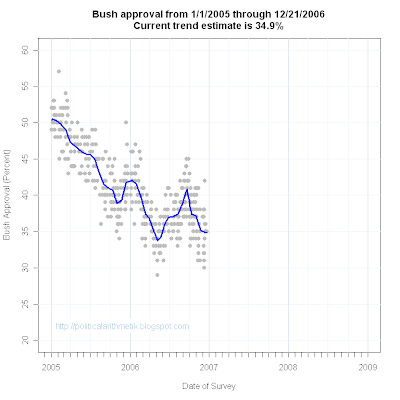 Sen. Obama's rise in support may provide an example. But the year long decline in support shows that Sen. Clinton must work to secure the nomination, rather than take front runner status for granted. By contrast, Sen. John Kerry (D-MA), who lost to President Bush in 2004, has seen support for a second nomination fall steadily throughout 2005 and 2006. While short term memories may focus on Sen. Kerry's lack of verbal facility late in the 2006 campaign, this decline in support has not been the result of a single slip of the tongue. From 20% at the start of 2005, Sen. Kerry fell steadily to 14% by the beginning of 2006 and to about 7% at the end of 2006. While the Senator appears to continue to plan for a second run, the steady fall in support, capped by late fall pre-election mistakes but by no means due solely to those slips, suggests that in fact few Democrats support a second nomination and that his early support has been due primarily to strong name recognition, especially in 2005. Another previous nominee has seen an opposite trend. Al Gore, the nominee in 2000 who has been quite reluctant to mount a new campaign, has risen in support from under 5% to around 17% in 2006, though he has fallen to about 12% as of December 2006. For such a reluctant candidate, Gore continues to do well as memories of the supposed shortcomings of his 2000 campaign fade from memory now refreshed with an outstanding powerpoint presentation translated to the big screen. Come to think of it, Ross Perot's 1992 graphs helped him too. Maybe powerpoint is the campaign technique of the future. The other 2004 nominee, for Vice-President, former Sen. John Edwards has maintained relatively significant support of from 10-15 points, though he too has declined a bit from 15% to 10%. More than enough to remain visible, but not yet a surge. His recent strong performance in Iowa polling suggests he may have more support where it counts, but again it is a long way to the caucus. Other widely mentioned candidates have remained well below 10% in the polls. Some having dropped out already (Bayh, Feingold and Warner) while others soldier on (Biden, Clark, Dodd, Vilsack). And New Mexico Governor Bill Richardson continues to be mentioned though without a visible campaign. So what has to be said remains that while candidacies may seem "inevitable" and others "doomed" by these numbers, the race is in fact far more winnable (and "losable") than polls 13 months or more out suggest. Remember that as late as early December 2003 Howard Dean was widely said to have the nomination sewed up and to be considering Vice-Presidential candidates. Recent polls from Gallup (12/11-14, Approve 35%, Disapprove 61%), CNN/ORC (12/15-17, 36%-62%) and ARG (12/18-21, 35%-61%) have helped pull President Bush's approval estimate up to 34.9%. Several polls in early December had pushed the estimate below 34% but in light of subsequent polling that now seems to have overstated the early December decline. The last five polls have ranged from 34-36% providing some consistent support for an estimate around 35%. The range of December results has been quite large, from 30% to 42%, though with half (8 of 15 polls) falling between 33% and 37% approval. With the holidays upon us and a delay in the expected speech on Iraq policy and plans there is little reason to expect a sharp change in approval. 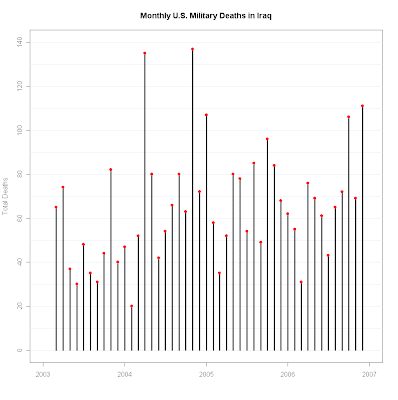 What effect events and that Iraq speech may have will await the new year. The 2008 presidential races are off to a running start, with candidates announcing, dropping out, changing their minds. And one of the leaders in the polls says she isn't running (Condoleezza Rice). In this first post of the primary season, we look at the Republicans. The data here represent EVERY person who has been included in ANY poll's list of potential candidates (and in the case of California Governor Arnold Schwarzennegger isn't even legally eligible for the office.) I've thought about editing the graph to remove those who have not become serious candidates, or who have tried and failed. But there is some virtue in a comprehensive look at the entire field as defined by pollsters' questions. 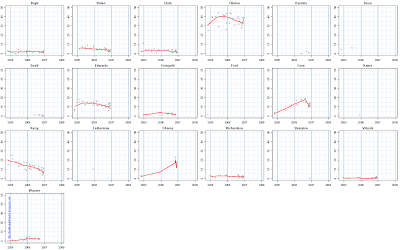 I plot the trend line only after 10 polls are available for a candidate. 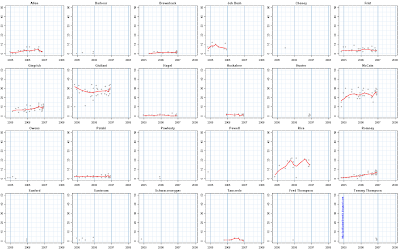 The poll results are represented by gray points in each graph regardless of how many polls are available, including those candidates who have appeared in only a single poll. One notable result stands out. Former New York City Mayor Rudolf Giuliani continues to hold a small but reliable lead over Arizona Senator John McCain. Of 39 polls with both names in the list of candidates, Giuliani leads McCain in 30 with four more ties. McCain leads in only 5 polls. So I was relieved to find that my impression of media coverage as MUCH more favorable to McCain was not just a delusion. It also appears at strong odds with the polling data. Giuliani leads McCain by an average of 3 points in the 39 polls. Not a huge lead, but a very consistent one. Much of the reporting seems to downplay Giuliani's chances of winning the Republican nomination, but given the negative opinion of McCain among many conservative Republicans, I wouldn't assume McCain can win easily either. Former Speaker of the House Newt Gingrich is usually in third place in the polls, showing considerable strength for someone who has been out of office for as long as he. Gingrich is, however, far behind both Giuliani and McCain. Massachusetts Governor Mitt Romney has shown slow but steady growth in support, though he remains far behind as well. Not surprising at this point when name recognition counts for a great deal in these early polls. None of the other potential candidates are so far generating much growth in support. In fact, none of these candidates outside the top 4 (top 5 if we count Rice) are averaging support of as much as 10%, and most are struggling to get to even a 3% average. Despite the dismal numbers I don't think that counts out these candidates at this point. There are substantial reasons to wonder if ANY of the top 4 of Giuliani, McCain, Gingrich or Romney can capture the Republican nomination, and that implies that there will be an opportunity for one of these "virtual unknowns" to emerge as a serious contender. It is a very long time until the Iowa caucus. I'll take a look at the Democrats tomorrow, and we'll put it all in historical perspective soon.